There’s a decent novel hidden in these pages, and I do appreciate what Whitewolf tried to do, but it just didn’t succeed for me. But let’s focus on the positive for a bit. Vivienne Du Lac, who in a future life was The Lady of the Lake (as in, “The Lady of the Lake, her arm clad in the purest shimmering samite, held aloft Excalibur from the bosom of the water…”) has been reincarnated into the modern life as a nervous, socially awkward historical researcher. One day, the reincarnation of her former bodyguard, Sébastien, shows up in town and everything goes to pot. Sébastien is dealing with the effects of an ancient curse, and is torn between his strong desire to serve and protect Vivienne, while being convinced that he’ll cause her harm. In her previous life, Vivienne was served by a demon dog — who finds himself as a large Caucasian Shepherd, with diminished magic. Alistair’s a fun character — sort of a canine Ben Kenobi. I really liked the fact that while, yes, this was your typical Chosen One fantasy; this particular Chosen One was an adult woman. This particular Chosen One has been brought back to stop the former apprentice of Merlin, Carleigh, from wreaking havoc on the 21st Century. He’s a very powerful necromancer now, and only someone of pure magic has a chance against him. I’m not really sure what this pure magic is, but that’s beside the point. It’s not just Carleigh they have to prevail over — he’s got a contemporary henchman, some druids, and Sébastien has run afoul of the Mob. I’ve got to say that I’m not sure what anyone (Sébastien in particular) sees in Vivienne, she’s pretty self-involved, treats everyone like a servant, and generally seems pretty spoiled. That said, it’s really easy to find yourself rooting for her and her guardians. The romance works because of their past (where, as royalty she acted a lot less like one than she does as a researcher). There’s some strong Arthurian themes throughout this book, mixed in with some contemporary tropes — a mix that’s sure to satisfy. Here’s my problem with this book — besides the personality of the protagonist — and the only thing that keeps me from strongly recommending this: the language. Whitewolf just doesn’t have the command of English to write this kind of book without a strong editor. She writes as if she had a Romanian-to-English Dictionary open next to her. It’s hard to complain about someone working too hard on a book, so hard that she ends up overwriting — the emotions are overwrought, the prose can be clunky, and frequently the words are just wrong (sometimes, not by much, but enough to draw attention to themselves and stop the flow of the narrative). Now I feel like a snob and a heel for saying that, but it detracted from what could’ve been a fun read. 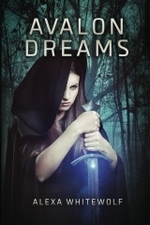 If you can get past the language issues, it’s a fun contemporary fantasy with Arthurian ties, and I can see where people would enjoy it — I did, but I had to work harder than I should’ve to get to that point. Disclaimer: I received a copy of this novel from the author in exchange for my honest opinion. Thanks, Ms. Whitewolf.